Did I mention it has bacon? So this is hearty and satisfying with a kick of heat, AND it can be done in about 30 minutes?!? YEP!!! 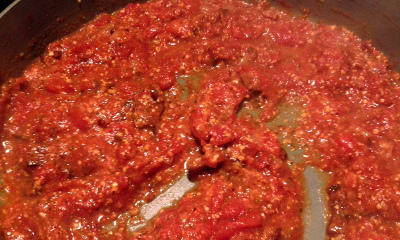 So you'll be trying Amatriciana soon, right? 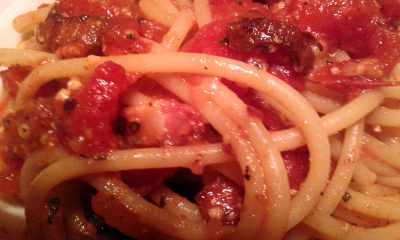 This is a somewhat rustic, quick cooking (fresh) sauce flavored by “bacon”, onions and garlic, tomatoes and basil... The source of heat is what seemed to be a minuscule amount of black pepper and red pepper flakes, but they did their job nicely! 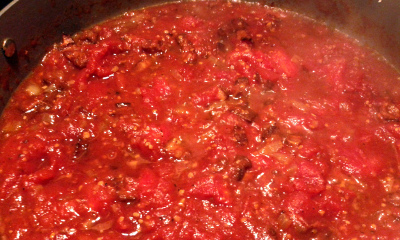 While that simmers for a whopping 20 minutes, start the water for your pasta. Bucatini is the classic choice, but whatever you've got would be okay. I specifically purchased bucatini, simply because it's fun! It looks like slender spaghetti, but it's hollow in the center and plumps up nicely. Slurping is optional . And it cooks fairly fast - the brand I used recommended seven minutes, and I pulled it in five (after tasting) to finish its cooking in the sauce. 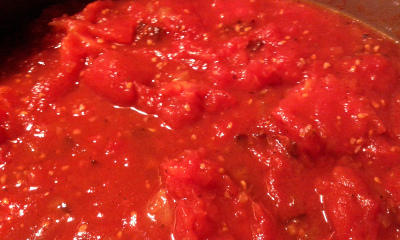 Even with that little bit of cooking see how rich the sauce looks once you stir in the Romano? Use a little pasta water to loosen it up, then drop in your drained pasta and toss until it is all well coated, adding more pasta water if needed (I HATE those photos with a little sauce on a mound of pasta – make it ALL flavorful)! I really, REALLY enjoyed this, and it's perfect for a weeknight meal. Cut back on the pepper if you must, but for a quick meal, this is quite excellent!